The Sumatran tiger is the smallest of the tiger subspecies. Populations have been declining rapidly in recent decades as a result of habitat loss from logging and palm oil plantations and poaching. There are an estimated 400 to 600 Sumatran tigers left in the wild. As tiger habitat becomes increasingly fragmented, there is a need to better understand how tigers use the landscape in order to preserve functional corridors and minimize conflicts between people and tigers. Our Population Sustainability and Recovery Ecology teams are working with mammal curators at the Safari Park to spearhead a new tiger conservation research project in Sumatra. A key goal for this long-term project is to collect detailed data on the ecology of tigers, including their movement patterns and diet, which will lead to more informed conservation actions. We will also train Indonesian researchers in camera trapping survey methods and data analysis, and develop other in-country capacities. 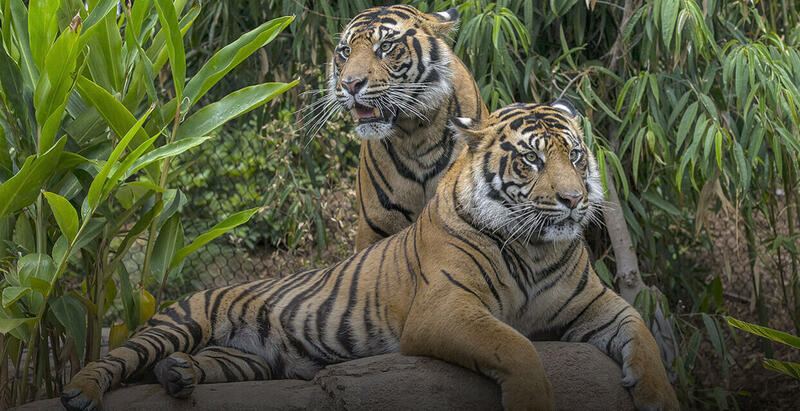 As part of a multi-year study, we have been collecting simultaneous behavioral and hormonal data on our tigers. This information helps us identify variables that influence individual breeding success in zoos by monitoring reproductive behavior and correlating it with reproductive and stress hormone levels. We can also use this information to monitor the transition of collection animals to new enclosures and assess any long-term effects on behavioral repertoires. This research forms an essential part of our commitment to maximizing welfare for the tigers in our care, as well as augmenting our upcoming field research efforts in Sumatra.